Obama Administration Ends Refugee Policy That Favored Cubans : The Two-Way The so-called wet-foot, dry-foot policy let Cuban migrants stay if they arrived on U.S. shores but not if they were intercepted at sea. Now they face the same rules as people from other countries. 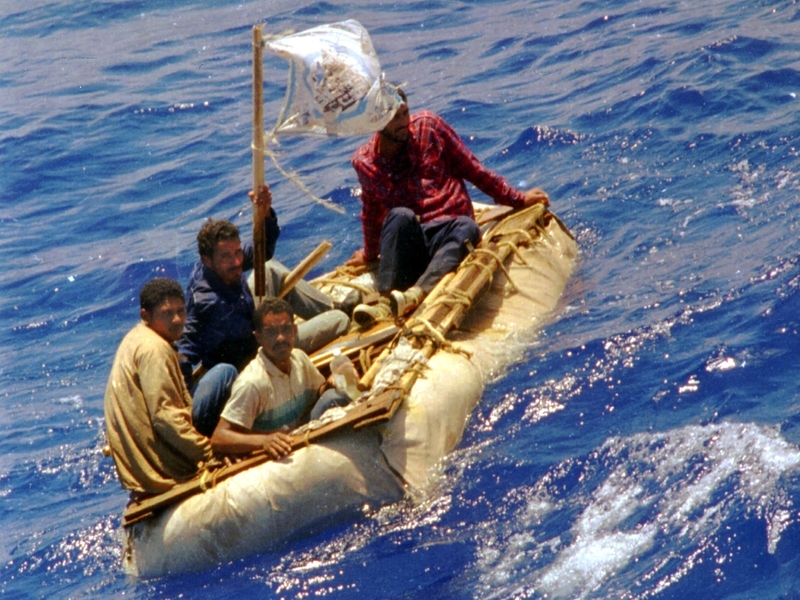 Cuban refugees float in heavy seas 60 miles south of Key West, Fla., in 1994. The Obama administration is ending a two-decades-old policy of allowing Cuban refugees to stay in the U.S. if they can make it to U.S. soil. The Obama administration is ending a two-decade-old policy that allowed Cuban refugees to enter the United States without visas. Known as the "wet-foot, dry-foot" policy, it began in 1995 under then-President Bill Clinton in response to a wave of Cubans fleeing the island in boats. The U.S. turned away those who were intercepted at sea ("wet-foot"), while permitting Cubans who managed to get to U.S. soil ("dry-foot") to stay and eventually become legal residents. According to The Associated Press, the policy shift, which is effective immediately, is part of the process of normalizing relations between the U.S. and Cuba. The U.S. has been pressing Cuba to take back people who are not allowed to stay in the U.S. The Cuban government has always opposed wet-foot, dry-foot, arguing that the policy encouraged people to leave. As The Washington Post reports, Cuban migration has increased notably since July 2015 when the two countries officially renewed relations, ending decades of Cold War estrangement. A December 2016 report by the Congressional Research Service says the maritime route out of Cuba has become less popular as more migrants choose to enter the U.S by land. More than 46,000 Cubans without visas attempted entry in the 2016 fiscal year, many along the Southern border and twice as many as in FY 2014. "Effective immediately, Cuban nationals who attempt to enter the United States illegally and do not qualify for humanitarian relief will be subject to removal, consistent with U.S. law and enforcement priorities. By taking this step, we are treating Cuban migrants the same way we treat migrants from other countries. The Cuban government has agreed to accept the return of Cuban nationals who have been ordered removed, just as it has been accepting the return of migrants interdicted at sea." The president also announced the end of the Cuban Medical Professional Parole Program, which allowed Cuban doctors and other medical personnel to seek temporary legal status in the U.S. Obama said the program "risks harming the Cuban people" and that such personnel are still eligible to seek asylum at U.S. embassies and consulates abroad. Both policy changes were condemned by Cuban-American Rep. Ileana Ros-Lehtinen, R-Fla., who said in a statement, "In another bad deal by the Obama administration, it has traded wet foot/dry foot for the elimination of an important program which was undermining the Castro regime by providing an outlet for Cuban doctors to seek freedom from forced labor which only benefits an oppressive regime." Sen. Marco Rubio, R-Fla, released a statement saying the existing policy needed to be revamped, not ended. In particular, he said he wanted Donald Trump to reverse the cancellation of the medical professional program when he becomes president next week. Rubio added that he had spoken with Vice President-elect Mike Pence this evening and was "heartened by the fact that in a week we will have a new administration committed to discarding the failed Cuba policy of the last two years."